We all know that Land speed racing at El Mirage and Bonneville is an essential part of Hot Rodding both as a birthplace and as a carrier of the tradition. But how did the Swedes get in to this ? Well, lets go back to some sort of beginning for at least me. In 1977, two years after the ending of the Vietnam war, at that time Sweden was mildly described different than today. Sweden was then a conformist society, the individual was a part of the collective managed by a Semi Socialistic Goverment with strong focus to control and define the best for the abidient Citizen. In some groups, something like an alergical reaction developed. These creative groups were searching for a different definition of; What was best for You. The reaction ended up in a strive to express yourself and dare to be different ....like building a Hot Rod.....and a curiosity of the American dream. 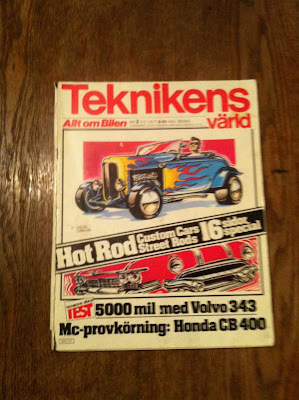 One of the first trigger or evidence for me was 16 pages in Tekniken Värld about Hot Rods, Customs and The American dream. Mind blowing at the time. In the article you could read about the Pioneers in Swedish Hot Roding, the ones who built the first 1932 Roadster according to how it was done in US, in those days. The right parts the right stance. The names of the pioneers were to become the guides for us, who were searching for ways in to Hot Rodding. The strength in this trigger was enormous. Instead of becoming a dentist like my father my focus turned towards the Automotive business and The Hobby. 40 years later I participated in Land Speed racing at El Mirage with our race car the 449 SSR Amazon. Next Year 2018 we plan to race at Bonneville. Due to above You find Swedes who have found there way to L.A. and we're as well busy being a part of the Hot Rod scene there. So when we rolled in at El Mirage with the SSR Amazon we ended up in a "Swedish (Scandinavian) Colony". Erik and Ruth unloads the 123, 29 Roadster. Behind Erik's and Ruth's pit you see the Salt Slush Racing Amazon Pit. Behind the Amazon you see Håkan Carlens Pit. Here's Ich as he takes a look. Ich worked by Volvo Cars in L.A. Volvo is kind of Swedish! This is Håkan Carlens, "Swede", racer built originally by Roy Fjastad who had some Norwegian connections if I remember correctly. 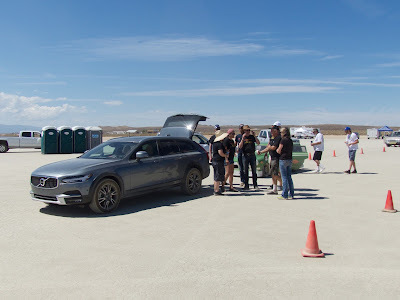 We had a Volvo V90 Cross Country as support vehicle which worked just fine. Dirt, Dust & Dreams -A mirage experiance. We're back. At least physically. But we've left our soul in the desert. The desert sun and the magic moon-a-like surface. The atmosphere and the amazing support from other racers and SCTA inspectors. The knowledge and knowhow from well known racers. For the easy going SCTA race administration attitude. For the energetic introduction to racing, sun, sand and all we needed to know. For the exclusive tailgate sandwich dinner on the dirt. For the cold Mirage at El Mirage. Good taste. Kept us cool. For the relief when the boiling waiting was over and we were good to go. For the peaceful hauling to the dusty race pit. For the for sweat, the dust and spirit. For the joined forces strong enough to get an Amazon on a Magnuson trailer. To see our racer get dirty and ready for the next step on a long journey. I scream, You Scream, We all scream for Ice cream ! After our first Rookie Run by Anders It was time to celebrate ! What could be better than an Ice cream ! Like a sign from above suddenly the Ice cream man passed by in the desert. You get a feeling for the serenity in the desert all accompanied by roaring engines. Whole team, except Magnus and the car ,is back in Sweden now. Magnus is working with finalizing the calibration for new Volvo's in Arizona and in Colorado. The 449 SSR Amazon is recuperating in LA. It's in a safe haven at Erik Hansson. We are curing our jetlag (with Makers Mark?) while having sweet dreams about our adventure at El Mirage. As a teaser we share some clips by Ich S who is friend living in LA. First run on 449 SSR Amazon run at El Mirage. Anders was at the wheel and he did a 139 mph rookie run. Here's a flavour of the dust and the rooster tail from the 449 SSR Amazon. Håkan was at the wheel and he did a 106 mph rookie run, before that he had made a 122 mph run. We've definitely reached a milestone. Because we're now El Mirage experienced. Here's a short version of what we've learned. But before we go there, we would like to THANK everybody that supported us in, for us, an amazing way. Kim and Mike, and their crew at Magnuson Supercharges for letting us use the Magnuson workshop, the amazing Supercharged Truck and allow us to take their time and talk Supercharges and Engine Boosting at the same time! Erik Hansson for hospitality and all advices, as well as lending us his 5 layer race suit (there was no time to tailor make one). Kiwi Steve for introducing us to Landspeed racing Safety and magically, from nowhere, finding a perfect hans device. Without these guys we've would, without a doubt, have been stranded. No question. We unloaded the Amazon for the first time in the hot desert. Felt great. First step was the SCTA (Southern California Timing Association) first time safety inspection. Thorough is the correct word. Yes, we were nervous. Directly after we've received our SCTA protocol (and a TODO list) and got our race car registered we had get going to the Rookie orientation meeting. In the El Mirage sundown, we learned all do's and don't in Landspeed racing. In addition, we learned how to not be that guy...I think we got it. Before the desert got too dark to work, we all started to tick off the points on the To Do list that stopped us from our Rookie Run the day after. Here's Magnus while pushing the angle grinder to the limit. And yes, we even managed to get the car approved the same night, thanks to a very supportive crew of SCTA inspectors. We even had the possibility to perform a safety bail out the same evening. At this point there was no time to go back the house we've rented, so we went to a hotel nearby and slept a couple of hours. A couple of hours later, at 06.30am Sunday morning, the team were back at El Mirage. Yes, it was cold before the sun rise. The sun rise in the desert is fantastic. At this point all kinds vehicles arrived, one by one. After a night in the desert and conditionally approved, the Amazon was ready for the first run. Our Rookie run. The National Anthem was sung with great passion. Anders had the privilege (and the stress) to be the first Rookie driver from Salt Slush. The task: Don't drive faster than 150mph! Rookie Run 1 is not to exceed 150mph, Rookie Run 2 is not to exceed 175mph. Anders is not freezing at this point in time. Fully strapped, with 5 layer suit, helmet, oven style gloves and balaclava in a car when it's +100degF (37degC) outside the car makes every minute of waiting feel like an hour. 138mph (220km/h) and Anders is not a Rookie anymore! Anders is sharing his first experience....he said something like; " it's NOT easy and the car is too strong"
Then it was time for me to get warm and yes, Anders was absolutely correct. It's NOT easy! With wildly spinning wheels on forth gear, I passed the timing tower in 121,53mph (194km/). I had no clue how fast I was going as I was sailing on the desert with the engine howling wildly. We almost reached as far as we wanted. We got the car to US, it passed SCTA safety inspection with a To Do list. But we have a long journey in front of us before we all fit the car and the car (and ourselves) are ready to reach for the record. We're getting closer...to our first race. On Sunday it's time for our Rookie Race. We've now gone through the To Do list from the pre-inspection and we've all become members in Sidewinders Car Club. We bought helmets, borrowed a race suit and now...it time to go to....El Mirage! Pre inspection and tick in the box! It was time. Time for inspection. Or rather, pre-inspection. The Salt Slush Racing Team listened carefully to inspector Doug Adler and his colleague as they explained the safety do and don't in Landspeed racing. The devil lives in details. And we all tried to get him out! Magnus ask questions. Doug explains. And yes, Doug gave us a TODO list. And yes, we needed an angle grinder as well. Anders is prepared do deeds. Success so far...but we're not ready yet! These milestones...Even if you can't see them, you feel them. And you know when you reached one. And we've reach one today. Where? Well, we're in Performance Heaven. Where good gets better and faster. Yes, we're at Magnuson Superchargers in Ventura, California. We love it! The El Mirage dessert is hot as hell, the time before the first race is short and there's a lot of things that needs to be taking care of before we're able to gain speed on the grey ground. ...seen the bar at Seligman along Route 66. A place with heritage & history. We seen pale Irish bikers in pain. In pain? We seen Carina staying close to the Camaro. And why is the top not down? This is why. We've seen 117deg F (47,2degC) on the dashboard when approaching Hover dam. We've seen the amazing boiling hot Freemont Street burlesque in Down town Las Vegas. Will not be forgotten. ...all around us...all the time. Feels good. Really good. There's hope for the future. We've seen amazing barn finds at Old Ford Store in San Dimas. We've seen Street Rods from far away nearby. We've seen Japan Turbo fighters. But no sign of hard rain. Hence, it's Miller Time.